The breathtaking views that can be seen throughout the Lake Tahoe region are populated by rolling mountains, hillsides covered with trees, and the pristine, 22-mile-long lake itself. The incredible landscape and snowy mountain tops bring a steady flow of tourists to area ski slopes, golf courses, casinos and nature trails year round. While popular with tourists and a draw for Lake Tahoe homeowners, the sloping terrain can present a unique challenge to local roofing contractors. “Around here we love to say that with Lake Tahoe, it’s always an adventure,” said Tom Goldston, owner of Tom Goldston Roofing in Gardnerville, Nev. The roofing company is located just 30-minutes driving from Lake Tahoe, and Goldston is no stranger to the difficulties the geography presents. Another unique feature of the area is the densely wooded forests that surround many homes. This also impacts which building materials are used by roofing contractors, as many homeowners seek out fire-resistant roofing options. Tom Goldston Roofing faced these familiar issues when they were tasked with installing a new roof on a home located right among the hills and forests of South Lake Tahoe in Glenbrook, Nev. The homeowners had just purchased the house with a nearly brand-new wood shake roof. While the look of the roof was one of their favorite features, the couple had some concerns about the material. Goldston recommended a new asphalt shingle roofing system for its superior fire-resistance rating. PABCO Paramount Advantage® Oakwood Signature Cut asphalt shingles were chosen for their ability to resemble the look of the wood shake roof while providing the fire-resistance the homeowners needed. At 495 pounds per square with a Class A fire-resistance rating, the shingles offered the thickness, color and safety features the homeowners wanted. A five-man crew spent six days removing the wood shakes and installing the new asphalt shingle roofing system, all while navigating the cliffs surrounding the back of the home. A Carlisle 300 high-temperature, water and ice protection underlayment was installed at the eaves and valleys to provide the necessary moisture resistance, followed by a Feltex synthetic underlayment. Contractors also installed a combination of soffit and continuous ridge vents along with the designer PABCO asphalt shingles. The completed project presents a beautiful, rich brown asphalt roof that blends in with its natural surroundings. The homeowners loved the aesthetics of their new roof, and were given peace of mind knowing that their home was now protected by highly fire-resistant asphalt shingles. The new roof continued to gain praise after it was completed when Goldston decided to enter it into an asphalt roofing awards program. Each year the Asphalt Roofing Manufacturers Association (ARMA) seeks to honor the most beautiful and high-performing asphalt roofing projects in North America. The organization’s Quality Asphalt Roofing Case-study Awards program (QARC) seeks out innovative commercial roofs, beautiful residential systems and everything in between, from renovation to restoration. Three winners are awarded cash prizes and national recognition annually. A panel of roofing industry experts and leaders judges each submission and names a gold, silver and bronze winner based on beauty, affordability and reliability. 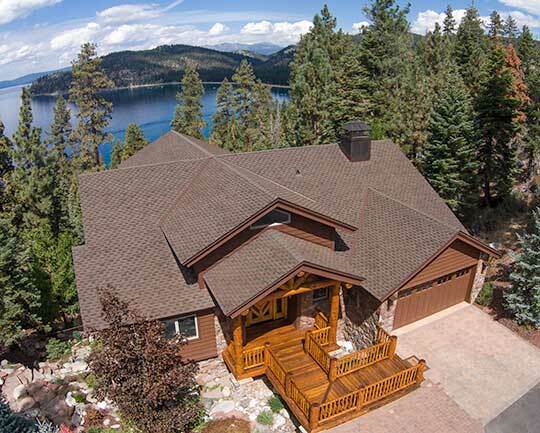 The South Lake Tahoe roofing installation received a Bronze QARC Award for its stunning appearance and because the asphalt shingle roofing system solved a critical issue for the homeowner. The judges applauded Goldston’s ability to install a system that mimicked the look of the original wood shake roof while providing fire-resistance. They also accounted for the unique challenges the contractors faced managing the hills and rocky terrain surrounding the home. ARMA’s 2016 QARC Awards Program is now open and accepting submissions for low and steep slope roofing installations that were completed in 2015. Roofing contractors can submit multiple projects, and there is no fee to enter. While aesthetics are taken into account by QARC judges, the program is not just a beauty contest. ARMA is searching for projects that also demonstrate innovation, performance and ingenuity. Past winning contractors have found interesting ways to provide buildings with protection from snow, wind and hail, or to lead the way in green roofing. Visit asphaltroofing.org/2016-qarc-program for more information about the awards program or to submit an entry. The deadline for submissions is Dec. 31, 2015.